- Waterproof polyester and TPU materials protect your items well in rainy and snowy days. - With unique structure and hard texture, it is shake-proof and wear resistant, which can stand up to bad weather and extreme environments. - Headphone hole design allows you to get earphones quickly and enjoy the music while cycling. - Open this bag by double zippers from the right side just like opening a book, extremely handy and convenient. - The compact package is enough to store a flashlight, tissues, sunglasses, keys, a knife and other small tools. - Adjustable velcro strap can be fixed on most bicycles, you can rest assured to buy it. We can help you at any time, if you have any problems with our products, please feel free to contact us by email. 【Touch Screen Design】 The screen made of TPU (thermoplastic polyurethane) and velcro, fits for mobile phone below 6.0 inches, such as iPhone 8s 8 7s 7 6s 6 and 5s 5 / Samsung Galaxy s7 s6. 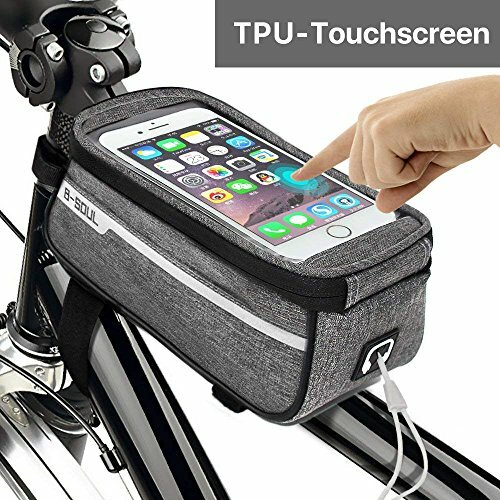 【Large Capacity】- This bike bag has 1L capacity, you can carry the needed items with you while driving, such as: wallet, glasses, earphone, key, card, powerbank and other small items. Of course you can also put gloves on one side of the bag, very portable and safe. 【Waterproof Material】- The products material is made of special waterproof fabric. This bike bag and zipper are waterproof design. It is perfectly protected against scratches / dust / rain. 【Velcro Strap】- Adjustable Velcro for quick removal and installation, easy to install and very stable, fits a variety of bikes. 【Headphone Jack Design】- There is a headphone hole on the bag. You can listen to music and answer calls anytime, anywhere, while driving, very convenient. 【Warranty 】 1 year warranty. If you have questions or need help before or after your purchase, please contact us and we will respond within 24 hours. We strive to provide you the best experience in the business, we will offer you a better service. If you have any questions about this product by Sporcis, contact us by completing and submitting the form below. If you are looking for a specif part number, please include it with your message.